By Gordon S. Johnson, Jr., Esq. 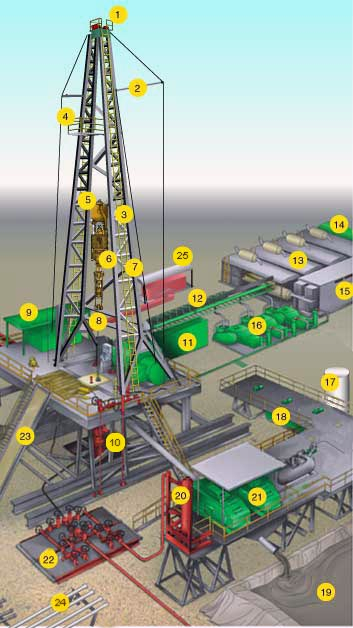 Shown is an illustration from the OSHA.gov page of all of the parts on an oil rig. Any of these parts could cause an industrial brain injury. Industrial brain injury accidents, can be industrial sized, literally. The bigger and the faster the machine, the greater the force against the skull and brain. The higher the heights, the more serious the fall. Explosions can occur. Hard objects can be projected towards the head. Proving the injury is rarely the challenge in an industrial brain injury accident. The challenge will be finding someone who is responsible other than the employer of the brain injured survivor. If someone other than the employer can be found at fault in an industrial brain injury accident, then what is called a “third party claim” may be possible. Generally, if the industrial brain injury occurred as a result of the fault of either the employer or the co-employee of the brain injured person, the action would be limited to that of a workers compensation claim. A claim against someone other than an employer is called third party, because the employer/employee relationship is considered to be a two party relationship. Fault of a fellow employee of the same employer is generally treated the same as the employer fault. While some compensation is allowed for workers compensation claims, it is usually less than could be recovered in a “third party claim.” State law on workers compensation is different from state to state, so it is important to consult with an experienced personal injury attorney to determine whether there can be a third party claim. The success of an industrial brain injury claims may revolve around the strict definition of who the brain injured survivor’s employer was. If the brain injured person was working for a technically different legal entity than the wrongful person, then a third party claim can be maintained. An example is a construction site where different subcontractors may all be working under the direction of a general contractor. If the general contractor is not the employee (the firm that write the payroll checks) of the injured person, then a third party claim could exist. Another example would be drilling sites, where multiple employment entities may be all be working on the same job at one time. The dock worker who gets run over by a semi, may have a claim against the driver of the truck, if they do not share an employer.